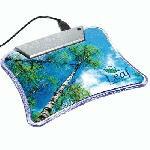 Our Webclick hubpad with logo from Calendar Lady Promotions is a small light hubpad with a www. button which links you directly to your website or a website of your choice. 4 USB ports and a large print area makes this a great product. So have your company details and business logo printed on, and you'll always be advertised. Other promotional and personalised items besides our Webclick hubpad with logo click here. To find out more about our Webclick hubpad with logo click here and fill in the contact form and we'll get straight back to you. Gift edition 5. Page 13. Item 4.